We took a look at some of the megatrends in our Quarterly Trends Report for Q1. When it comes to content engagement by category, we found some interesting trends for you to consider to help you maximize engagement on your site. 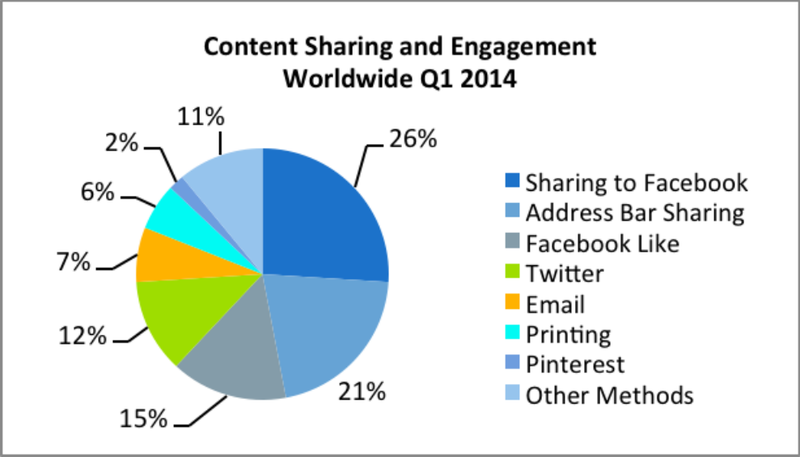 Sharing to Facebook leads at 26% of all sharing and engagement. What might be a surprise is that copy/paste URL (also known as address bar sharing) is in second place at 21%. After that the Facebook Like comes in 3rd at 15%, which is ahead of Twitter at 11%, followed by printing’s 6%. Help us get the word out! Here’s an infographic for you to share! Here at AddThis, we’re all about getting your readers to engage with your content. Our mission is to help you drive more views, shares, clicks and ultimately more traffic to your site. The other side of the equation is of course is coming up with a great content strategy, so hopefully this information has given you some ideas for new things to try on your site! Do you know what pages from your site are triggering engagement in different ways? Sign into your AddThis dashboard to find out and learn how your trends compare to the averages we’re seeing across all sites that use AddThis tools.